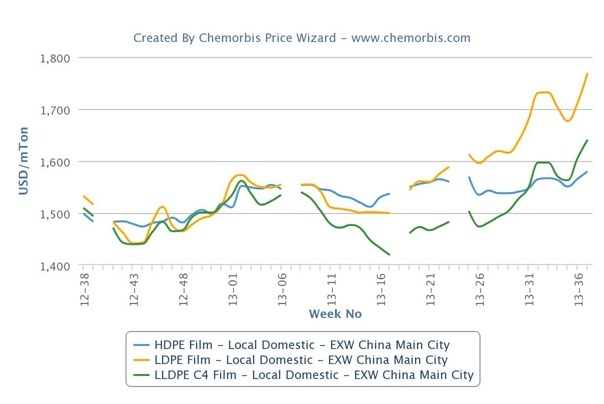 In China, domestic HDPE, LDPE and LLDPE film prices rose to year-to-date highs during this past week while offers for locally held import cargoes also followed the lead of the domestic prices and hit their highest levels of 2013 as per the pricing service of ChemOrbis. Locally held LDPE and LLDPE film prices jumped CNY150-550/ton ($25-90/ton) while HDPE prices were stable to CNY100-300/ton ($16-49/ton) higher over this past week on the back of the higher upstream costs. 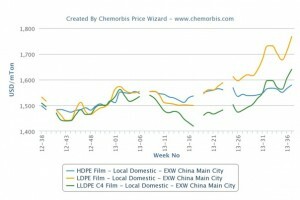 A distributor said at the end of the week that local PE prices saw slight decreases when compared to levels at the start of last week despite higher LLDPE film futures. “We are mostly focusing on our sales in order to maintain our margins but we are planning to act cautiously when making fresh purchases due to the uncertain market outlook after the approaching holidays. Plus, the crude oil market is very volatile at the moment,” he further added. According to ChemOrbis, although sellers’ prices indicate an upward trend, buyers are generally skeptical about the feasibility of these hikes when considering the upcoming holidays at the end of September and the beginning of October along with the easing in tension regarding Syria, which started to cool off the energy markets.